I find both pork scratchings and pork crunch great pub snacks. It's the saltiness mixed in with the porky flavour that brings out the flavour of the beer. Unfortunately I didn't have a beer handy, only a sandwich, when I came to sample these Chicharon Hot & Spicy Pork Crunch. Then again I try to avoid beer when I have something very flavoursome or chilli hot, because the intense flavours and burn can detract away from the beer. There was a heavy pork rind smell on opening the big bag. The pork crunch inside was covered liberally with red flecks of chilli. The pork crunches were a mixture of sizes with most being very big and fluffy with an excellent crunch. They had a salty flavour to start with which was quickly replaced by a fiery peppery chilli burn that lingered in my mouth, making me want another both for its moreish qualities and to ward off the shear burning sensation left in the aftertaste. After a few crunches my nose started to sweat a little. I started the bag with the heating on and wearing a jacket whilst eating my lunch watching the TV. Half the bag through I had to take my jacket off and turn the heating off as the pork crunches warmed me from inside to out. 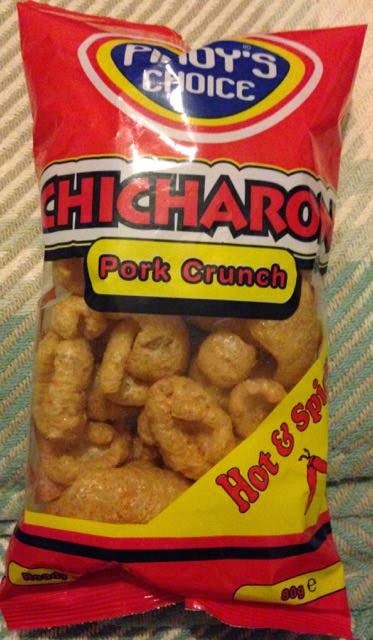 These pork crunches would warm up an Eskimo! I could really appreciate the flavoursome burst with every pork crunch. These crunchy treats melted in the mouth after a few seconds of crunching and saltiness to produce an explosion of hot chilli. Really tasty, really hot, really good. 80g bag made by Pinoy's Choice, produced in the UK. 472 calories per 100g, with 20.9g of fat. Ingredients included; pork rind, sugar, dextrose, potato starch, salt, spices, tomato powder, red bell peppers, garlic powder, yeast extract, onion powder, parsley, natural colours, and spice extract. Not for vegetarians!